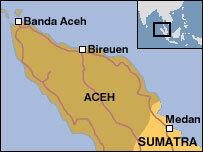 Indonesian troops have killed at least seven suspected rebels in the province of Aceh, an army spokesman has said. The rebels, from the Free Aceh Movement (Gam), were killed after an army patrol noticed them heading towards a refugee camp, said Ari Mulya Asnawi. The army has accused the rebels of taking aid destined for victims of last year's devastating tsunami. In the wake of the disaster, the government and rebels held their first face-to-face talks in almost two years. Both had agreed to an unofficial ceasefire to facilitate the delivery of aid to affected regions. But the talks - in the Finnish capital Helsinki - ended without agreement, and the two sides are expected to meet again later in February. The seven rebels were killed on Sunday near the rebel stronghold of Bireuen, said army spokesman Ari Mulya Asnawi. Another suspected rebel was also captured and three rifles confiscated, Mr Asnawi added. He told the Spanish news agency EFE that Gam members had been asking local villagers and those in refugee camps for food and help to continue their separatist campaign. The army has even accused rebels of attacking aid convoys - a charge they have vigorously denied. Abdullah Zaini, a Gam spokesman living in exile in Sweden, told the Associated Press that he was unaware of the deaths on Sunday. But he added that the military seemed determined to continue combat operations despite the tsunami. "It just shows that the Indonesian army does not care about the need for peaceful conditions in order to enable the relief operation," Mr Zaini said. Indonesia has so far buried more than 111,000 people who died in the December tsunami, while more than 127,000 others remain missing, the government said last week.